1. Our bands ONLY fit for Garmin Vivofit 1. 2. Fitness Tracker Not Included. Warranty: You can get 30-Day money back, 18-month warranty for quality-related issues and lifetime friendly customer service. 1. 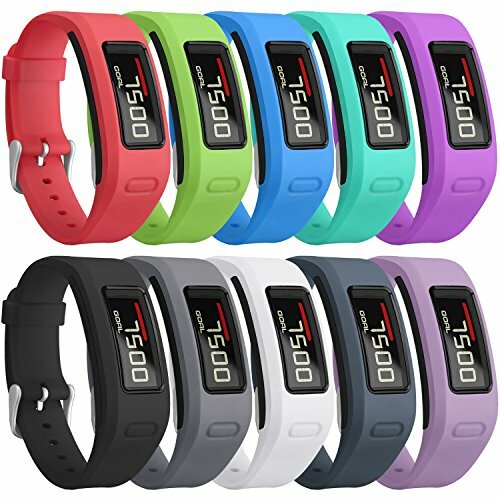 Our bands are made of high quality silicone material, soft and durable, will not irritate your wrist, you can wear it when and where possible comfortably. 2. The high quality stainless steel buckle and silicone ring can help to protect your bracelet from coming loose effectively, very safely, securely and firmly. You can wear your wristband without worrying about falling off. PREMIUM MATERIAL: Our Garmin Vivofit bands are made of medical-grade rubber, soft, skin-friendly and elastic, comfortable for sporting time, nice replacement for lost or damaged bracelet, you can wear it at all hours of the day or night comfortably. DOUBLE PROTECTION: A high quality stainless steel buckle, free from rust, will not fall off or become deformed; the silicone fastener ring/keeper is soft but durable, help to protect the band from coming loose and falling off effectively. AVAILABLE LENGTH: [5.1''-7.5''/130-190mm]. There are multiple precise holes for you to adjust the bracelet to a suitable length. You don't have to worry about improper size. OPTIONAL FASHION COLORS: Various color bands for you to use for your every outfit every day, perfectly fit women and men, boys and girls, creates a strong statement for yourself. CUSTOMER SERVICE: If there is any quality problem or something wrong with the colors, please don't hesitate to contact us. SKYLET will happy to help you and will resent you a new one. If you have any questions about this product by SKYLET, contact us by completing and submitting the form below. If you are looking for a specif part number, please include it with your message.